It is our belief that the spirit of those that have died in a car accident remains at the scene they last lived. Some folks would get some sort of closure to such a tragic event over time, knowing there is a possibility a loved one may still be at a place where they had last lived. A lot of folks will make a small memorial by the roadside with flowers and pictures of a loved one that had lost their life. Some of these folks that do this also believe that the loved one still occupies the area. 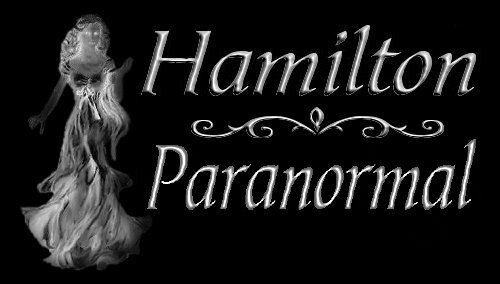 This investigation is dedicated as a memorial to those that have died in a tragic car accident and met death before their time. We are sure that they would not want to be forgotten as time passes on. 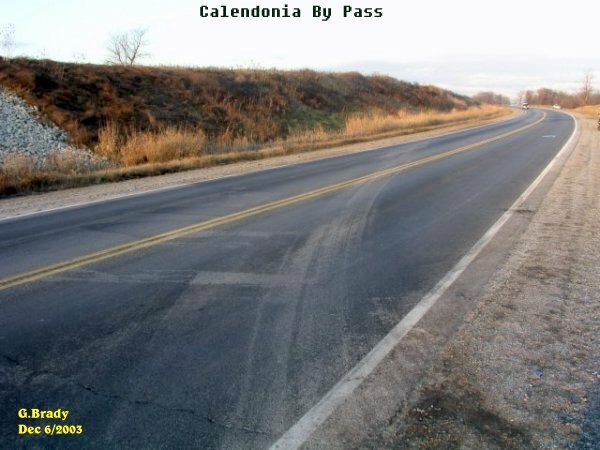 December 1st, 2003 was a cold but clear day as a jeep Cherokee was traveling north bound on the Caledonia Bypass, when all of a sudden it crossed the center line into the path of an 18 wheeler traveling southbound at about 8:30am in the morning. Ervin Rapai was driving the jeep that was heading for Hamilton. He was to stand trial for accusations of murdering his wife Heather Rapai. His trial had commenced back in October 2003 and Ervin was out on a $450,000.00 bail bond. Standing accused, Ervin Rapai never got his day in court. On this fateful day Ervin was only hours away to plead his case. 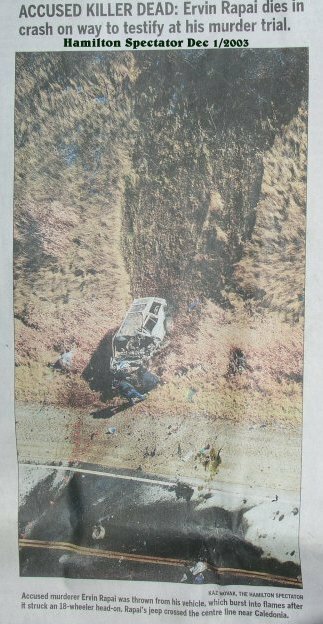 Rapai's vehicle burst into a spectacular fiery crash with the transport causing Mr. Rapai to be ejected from his vehicle. He was killed instantly. 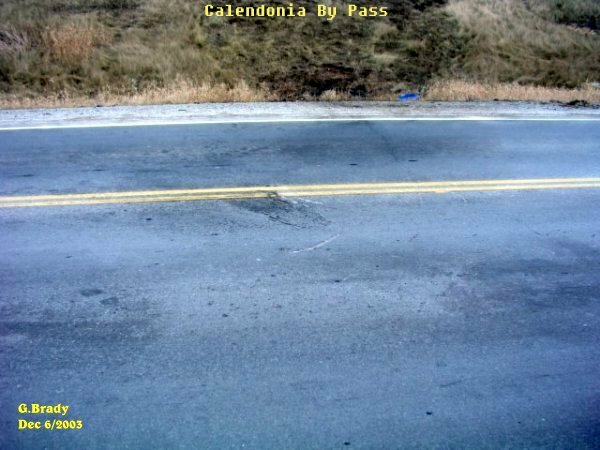 The Ontario Provincial Police could not come up with a reason how this crash could have occurred, for road conditions were good. Mr. Rapai was a shift supervisor at the Imperial Refinery in Naticoke, Ont. He had pleaded not guilty to his estranged wife Heather Rapai's first degree murder charge. The slain woman's brother was stunned by the news of his brother-in-law's death and told reporters that "this was the last thing we wanted to see happen." Pictured above is a birds eye view of the accident. You can see where the transport had come to a stop after the impact with the jeep. And to the left of the picture you can see the jeep where it ended up. In a very ironic turn of events, Serg Paul Berzo was the first officer at the scene of the crash. He was the same officer that had interviewed Mr. Ervin Rapai two years prior, after the discovery of his wife's battered body in their Simcoe home Apartment. Mr. Ervin Rapai had always maintained his innocence to the charge of murder. So what happened on that fateful day? Did Mr. Rapai fall asleep at the wheel, or did he commit the act of suicide so he would not have to stand trial? Or in some way did his wife come back from the grave and appear in front of his vehicle where he had to swerve to miss her? Or maybe she turned the steering wheel into the path of the transport? Was Ervin guilty for his wifes murder? We will never know any of the answers to the questions above. One thing is for certain, this was a very tragic event to happen to anyone. 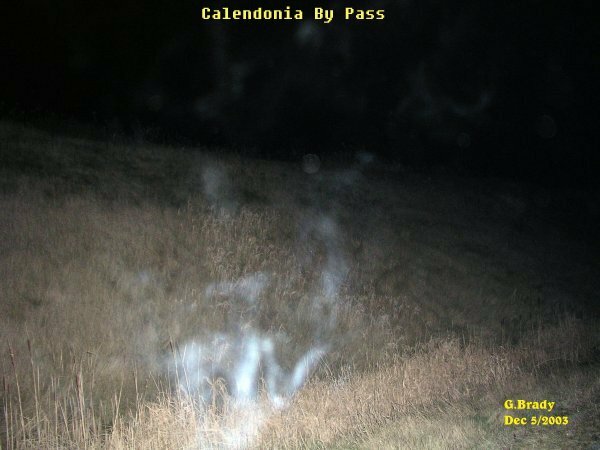 On December 5th, 2003 we went to the crash site out on the Hwy 6 Bypass of Calendonia, Ontario to investigate the area where Ervin Rapai had been killed. 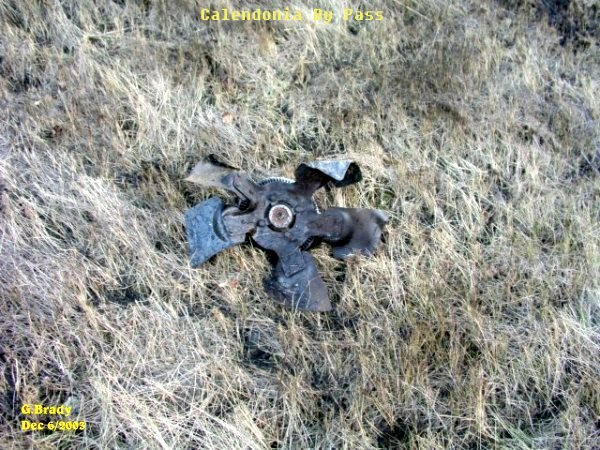 In the above photo you can see the tire marks that were made by the transport that was involved in the accident. On the right hand side of the photo near the bridge was where the Jeep had ended up. The whole area of this section of road had an eerie feeling to it while we were out there. Cindy and Alicia looking through some of the debris that was left behind after the Jeep Cherokee had burst into flames. The fan blade from the jeep was almost all the way up the hill, where the jeep came to rest at the bottom of the hill. This gives one some idea as to the impact that had occurred a few days ago. The fan blade was bent badly. 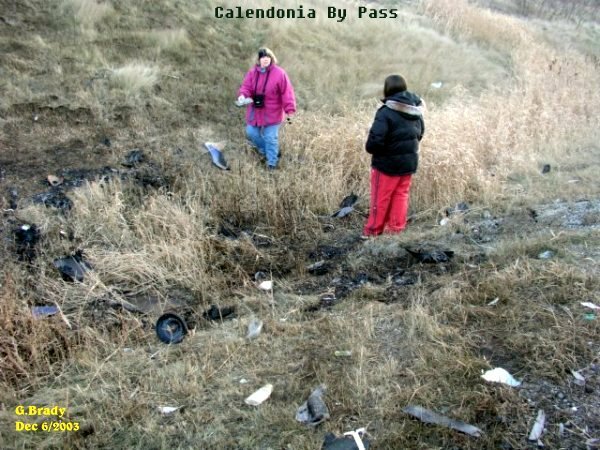 To get a better idea of the impact of the collision, Cindy examines the air bag that was part of the steering wheel in the jeep that was found some 25 feet away from the point of impact. 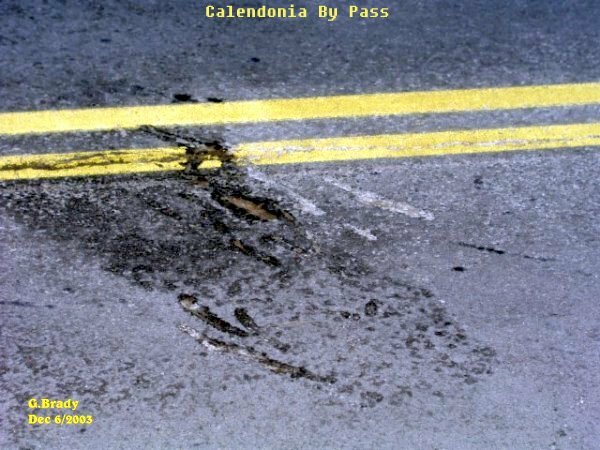 In the above photo you can see where the impact on the highway had occurred. 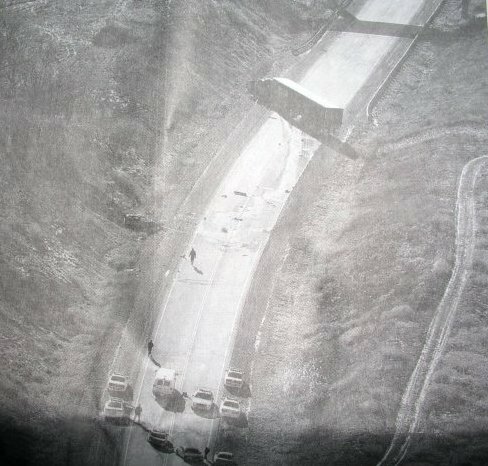 The dug in marks on the road show that when the jeep made contact with the transport, the tires on the jeep exploded and the rims dug into the asphalt causing the jeep to over turn and be pushed off the roadway. The impact would have ruptured the gas lines and while the jeep was turning over the metal of the jeep would have acted like a flint, turning the jeep into a fire ball. This is a close up view of the impact point where the rims of the jeep dug into the pavement. The area was very quiet, yet it had a strange feel to it. In the above photo you can make out a shape of a person lying on the side of a hill in ecto form. It almost appears as though this image of a person had its limbs in a distorted form. 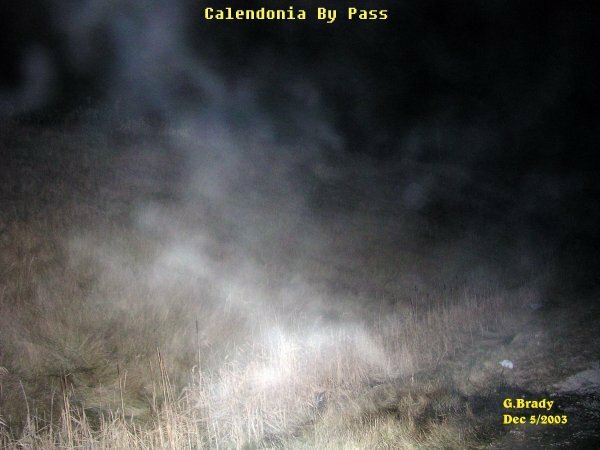 In this photo it shows what looks like the upper part of a person that seems to be coming up from the ground in ecto form. In this photo you can see Cathy trying to get a sense of something in the area where the jeep had come to rest. It appears as though she had some energy forms just above her in ecto form. At the time this photo was taken Cathy had said she had a severe headache that all of a sudden came on. This investigation had a very strange vibe to it without a doubt. Was this the spirit of Ervin Rapai trying to make contact, or was it someone else? We can not say for any certainty that this was Ervin, but we believe it may have been. The area did prove interesting to investigate and we are planning to go back to conduct another investigation.